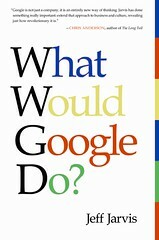 What Would Google Do? is a month away. I know you’re not counting the days, but I am. Here‘s its web home, where you can preorder the book (thanks in advance) from Amazon , Barnes & Noble, Borders, or Powells. Here‘s its Facebook page, where the discussion will continue, I hope. As a hoot, the publisher (Collins) made a CafePress store, where you can order WWGD? buttons, mugs, and T-shirt (I’m holding out for hats and bumperstickers). There’ll be an audiobook (for which I tortured the producers reading at three times normal human speed; they had to find 100 nice ways to tell me to slow down), an electronic book, a V-book (an E-book with video), a Kindle version, and a video version. I’ll soon be posting WWGD? : The PowerPoint for free. The publisher also plans to put up pieces of the book for free; more on that later. So far, I have one trip scheduled to California for the book. When and if other events are scheduled, I’ll update the book pages. Pardon the hype. I’ll try to keep it to a minimum (though your idea of minimum and mine may be slightly different). Now we return to our regularly scheduled snark. Check out the newest Books from HarperCollins and bring them to your Desktop.